NYFW is coming to a close and it has certainly been a long and grueling week! Of course, this is one of my favorite times of the year and I do not want it to end. 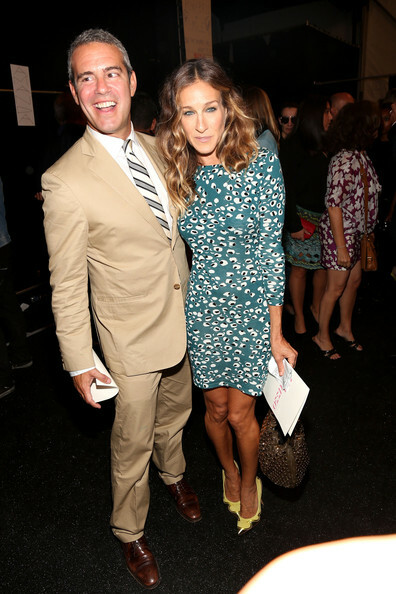 Sarah Jessica Parker took in some fashion shows for the season and she was spotted front row at Diane von Furstenberg’s Spring 2013 show. Naturally, she wore a look from the brand in a Kivel Dress in tiger eye teal. So cute and how amazing is her body? Her cotton and silk knit sweater dress is perfect for Fall, featuring an eye-catching tiger eye print. Diane von Furstenberg’s Tiger Eye Teal Kivel Dress retails for $325. Visit www.dvf.com to purchase.